In September and October of 2011 Arrington de Dionyso will be making his first ever voyage to Indonesia, at the invitation of Yes No Klub -an experimental music collective from Yogyakarta. 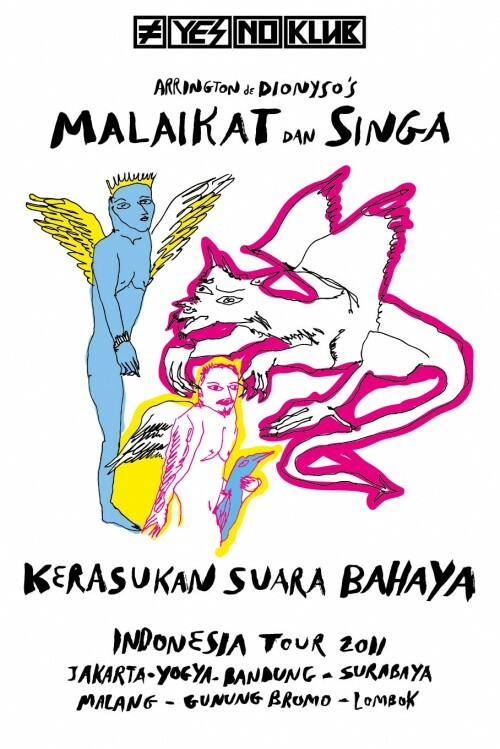 He will have several weeks’ residency in Yogyakarta where he will be teaching throat-singing workshops and creating murals while also collaborated with local musicians to create an entirely new version of Malaikat Dan Singa with Wukir Suryadi (Bambuwukir, Senyawa), Dani (Armada Racun), Ichan Sani (Armada Racun, Shoolinen) and other musicians from Indonesia. The tour will also featuring two finest contemporary artists: Senyawa and TerbujurKaku. Wukir Suryadi invite him to join his performance at four world music festivals, "Suara Mantra World Music Festival" in Mataram, Lombok island, "Space is Ours" in Denpasar, Bali island, "Bamboo World Music Festival" in Bandung, West Jave and a festival in Mount. Bromo, East Jave. The journey with Malaikat Dan Singa started in Jakarta at SubStereo Oz Radio, "Jakarta Noise Fest #3" and at a fringe programme of "OK Video Festival"; then they will move forward to Bandung, Malang, Surabaya and the final performance will be held in Kedai Kebun Forum, Yogyakarta which also an exhibition of Arrington's drawings. He will also publish a book of whatever paintings are produced during my residency for publication in a small artist monograph edition. Some of these concerts will be documented by film maker Vincent Moon, famous for his work with A Take Away Show and La Blogoteque. This project supported by Yes No Wave Music, Langgeng Art Foundation, Common Room, Ruangrupa, Insomnium, WastedRockers, KUNCI Cultural Studies Center and Kedai Kebun Forum. A curated monthly series of events. The events will concentrate on cultural and musical exchange between visiting and local artists. Events will range from experimental / sound orientated performances through to more conventional band and electronic performances. The events will focus on presenting new and unheard sounds and combinations to the people of Yogyakarta and aim to link artists from Indonesia to an international network of experiemental/other musicians and sound producers.